Home → COMING SOON: New BHS and Harmony Marketplace web sites! New web sites to debut! Life is growth and change, and we think you’ll see plenty of both in Barbershop Harmony Society new sites deploying next week. Our flagship site www.barbershop.org sports a clean new look that will display beautifully on all devices. A new platform should speed development of more kinds of content, and enhanced search capabilities will make it easier to find, enjoy, and share with your friends. 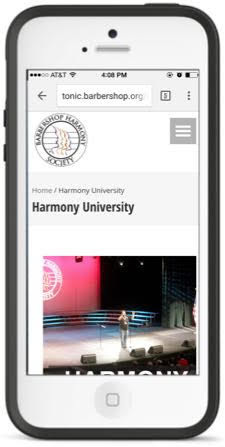 The new design will also integrate many previously-separated sub-sites such as barbershopconvention.com, harmonyuniversity.org and others, into a single, searchable location. Most notable will be the redesigned, super-speedy, mobile friendly Harmony Marketplace, which will migrate to a new address at shop.barbershop.org. A robust new ecommerce platform will make it faster and easier to shop for recordings, sheet music, apparel, and more. You should see immediate improvements in receiving your orders, as your online purchases move directly from website to our shipping department. You’ll get instant email confirmations for placing an order, see it move into our processing department, and receive UPS or US Postal Service tracking codes when it leaves Harmony Hall. Sheet music search has been beefed up, with ability to search on arranger, title, and category. Look for the new sites to begin rolling out early next week.